The HPA V220 was developped with the target to enable ultimate transmission quality for low- , medium- and high-impedance headphones. Due to its specific, variable, low-noise and low-distortion circuit design especially optimised for dynamic headphones, the HPA V220 fulfils even most sophisticated demands. Furthermore HPA V220 offers selectable inputs and an output management. The inputs and outputs are situated on the rear panel, they are equipped with electronically balanced gold plated XLR connectors and unbalanced gold plated RCA connectors. This amp may be additionally equipped with one of six different digital inputs: Coaxial, optical or USB with either 24/96 kHz or 24/192 kHz Balanced and unbalanced line outputs on the rear panel. These can be set to have fixed output level (mirrored from the input) or variable output level from the volume control. Volume control is provided with a high-grade ALPS RK 27 pot with a large full metal rotary knob. Additionally a balance control serves to correct the stereo image. V220 incorporates the award winning famous 8-transistor (per channel) amps from V200 for a smooth and relaxed sound stage. The output management enables the amp to act as your personal preamp when desired. Feel free to activate the headphones outputs or the line outputs independently from each other with dedicated buttons on the front panel. Lots of protection circuits will care for the safe operation of your headphones. Two headphones may be connected via 1/4" jacks on the front panel. Case and back panel are made of aluminium and are Nextel coated. The 8 mm aluminum frontpanel is milled, sand blasted and anodized. The labeling is laser engraved. 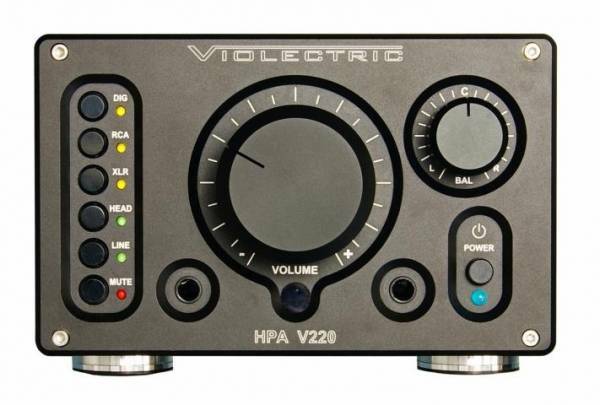 Related links to "Violectric HEADPHONE AMPLIFIER HPA V220"
Customer evaluation for "Violectric HEADPHONE AMPLIFIER HPA V220"